Some things in life are bad, they can really make you mad. Other things just make you swear and curse. When you’re chewing on life’s gristle, don’t grumble. Give a whistle, so that all of your friends can join in on the riot as well. Okay so that might not be the exact lyric from Monty Python’s “Always look on the bright side of life” but it seems rather apt as RIOT: Civil Unrest has begun violently protesting on Nintendo Switch today. For $19.99, you can choose to riot or defend the peace in 4 campaigns and 30 scenarios. Inspired by real-life events, will you choose to be a peaceful protest or will you change tactics to be more aggressive? Tuesday, 5 February, 2019, Manchester, UK. – Merge Games Ltd., is proud to announce the release this week of RIOT: Civil Unrest, a real-time riot simulation experience on Xbox One, PlayStation 4 and Nintendo Switch (PC Next Week). RIOT: Civil Unrest was born out of the real-life experiences of its artist and creator, Leonard Menchiari. During the summer of 2011 Leonard attended the NO-TAV protests in northern Italy. There he witnessed first-hand the actions of both the protestors and law enforcement officers. Thinking the interactive nature of video games would make it the perfect medium to show how riots develop, Leonard put to good use his documentary-making and pixel art skills. RIOT: Civil Unrest is a unique, thought-provoking experience that places you at the heart of some of the world’s most recent confrontations. A complex strategy game, RIOT: Civil Unrest sets players objectives for each scenario. It’s then up to the individual to choose how to tackle each situation, employing different strategies and tactics in order to achieve the perfect outcome. Discover if you can dispel an angry crowd or overcome a well-equipped militia with RIOT: Civil Unrest. Player performance is rated, aggression can lead to a quick, successful outcome but a softer approach may have the same resolution without damaging public opinion. 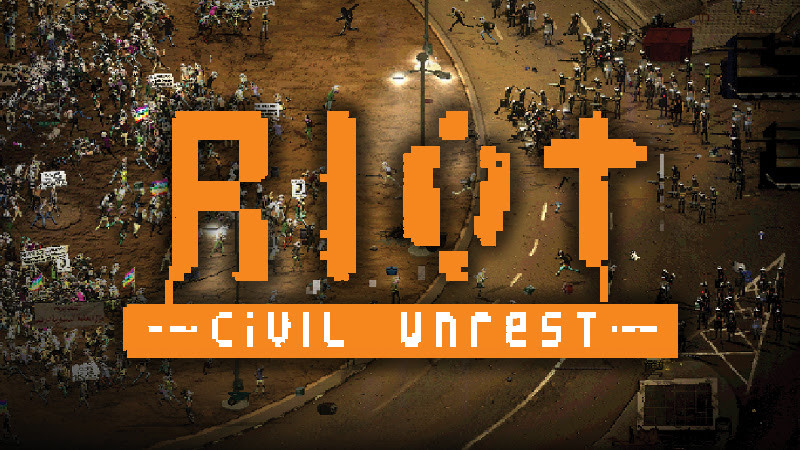 Spread across four campaigns and featuring over 30 individual scenarios, from Oakland in California, to Tahrir Square in Egypt and Caracas in Venezuela, RIOT: Civil Unrest lets players control either the protestors or law enforcement, in an effort to portray a balanced view of each event.